I’ve always had a fondness for the C3 Aircross – it’s looks different without being ugly, and it has that awesome, award-winning three-pot 1.2-litre Pure Tech turbo motor that is just sublime to drive. I think the last car we tested this in was the Peugeot 2008, and it was excellent. As well as that, it’s extremely practical, with the front seat being able to be folded flat so on that weekend run to Bunnings you can get a 2.4-metre length of timber in the car. Those with Skoda Yetis looking for a replacement? This could be the answer. Looking at the spec sheet, it’s pretty well equipped for the money – things like auto parking at sub $34K is a new benchmark. Read below on the details for the new model, and be warned, this is from a press release so take things like “unrivalled spaciousness and passenger comfort” with a grain of salt. 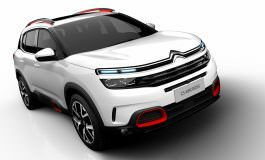 After the successful launch of the C3 earlier this year, Citroën now welcomes a new addition to the New Zealand range with the arrival of the all-new C3 Aircross SUV. This new small SUV is bursting with personality and offers unrivalled spaciousness and passenger comfort while also allowing owners to express themselves with an extensive choice of exterior colour combinations. Along with its striking sense of style, the C3 Aircross SUV delivers a full complement of advanced safety features and comes with a top 5-star safety rating. Efficient power is delivered by Citroën’s 1.2 Pure Tech engine enabling effortless driving while keeping fuel consumption to a minimum. In short, the C3 Aircross is the perfect SUV for you. The C3 Aircross SUV sets itself apart in an increasingly popular small SUV sector with its unique body styling. Owners can assert their personalities further, thanks to the unprecedented levels of personalisation with the choice of up to 60 exterior colour combinations and five different interior designs. The generous palette includes eight body colours, three roof colours (Ink Black, Natural White, Spicy Orange) and three Colour Packs (Orange, White, Black) which is applied to the roof bars, door mirror caps, headlamp trim and centre wheel caps. Owners can also choose the ambience of the interior with five trim themes offered. 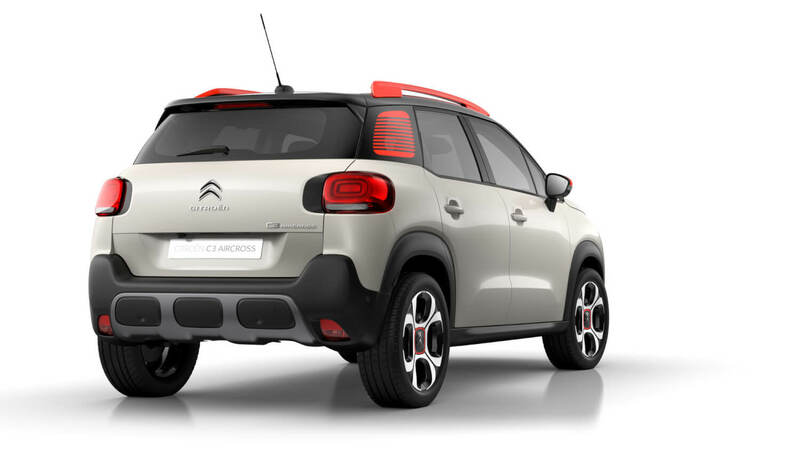 C3 Aircross SUV comes standard with Mica Grey cloth seats, a black dashboard décor and chrome trim highlights. 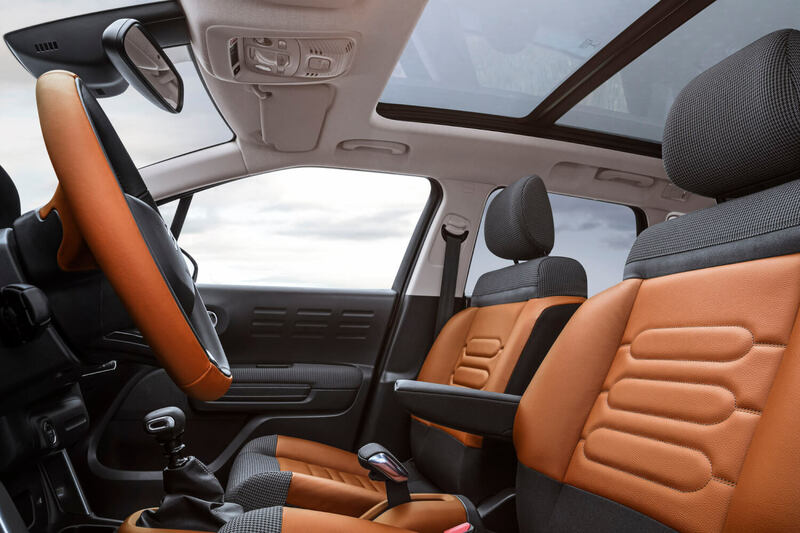 A lighter cabin tone comes via the $500 Metropolitan Grey option which adds an orange stripe to the seats, a driver’s seat armrest, a grey cloth-wrapped dashboard and orange trim inserts. The $750 Urban Red design mixes grey tones with a red stripe and details along with orange overstitching and a black dashboard décor. Leather is added with the $1000 Hype Mistral option, the seats trimmed in a mix of grey hide and cloth with a black finish for the dash and the $1500 Hype Colorado adds a premium approach with a light brown leather contrasting tastefully with grey cloth trim and a leatherette dashboard in the same colour as the leather. 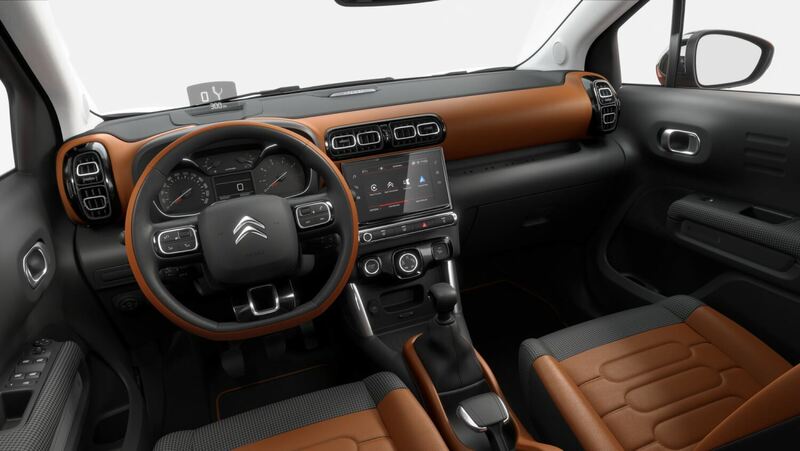 The C3 Aircross SUV features the new Citroën Advanced Comfort® programme, an innovation which enhances interior spaciousness and a feeling of well being for passengers. 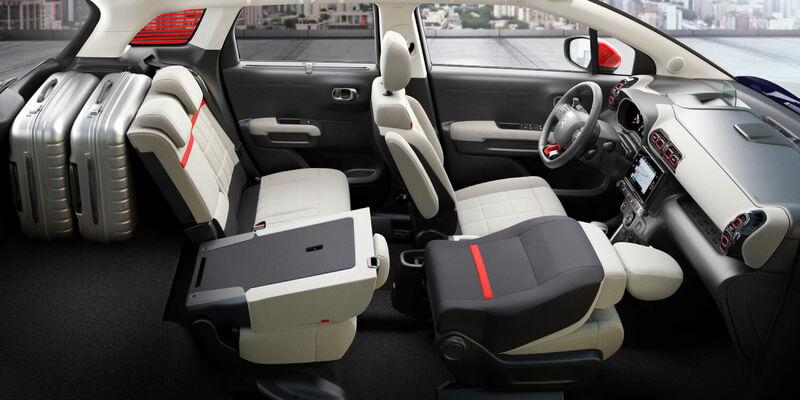 With its ingenious architecture, the C3 Aircross SUV has an urban friendly compactness but offers outstanding roominess in its cabin. It’s a small SUV that eases your everyday life with absolutely no compromise to comfort or functionality. A welcoming environment is created by the horizontal design of the dashboard, freeing up space, and by the wide, comfortable seats. Rear passengers aren’t forgotten with generous legroom, a tall ceiling height for ease of entry and window blinds. Need more light? There’s an optional opening panoramic glass sunroof. Added versatility comes by way of the rear bench which features sliders and a 60/40 split. With a flat-folding front passenger seat, a load length of 2.40m can be realised. The boot’s standard volume of 410 litres can be increased to 520 litres with the rear bench in its forward most position. Total load volume with the rear seats folded is an impressive 1289 litres. The C3 Aircross SUV line has one highly specified variant packed with intuitive technologies to make life on the road easier and safer. 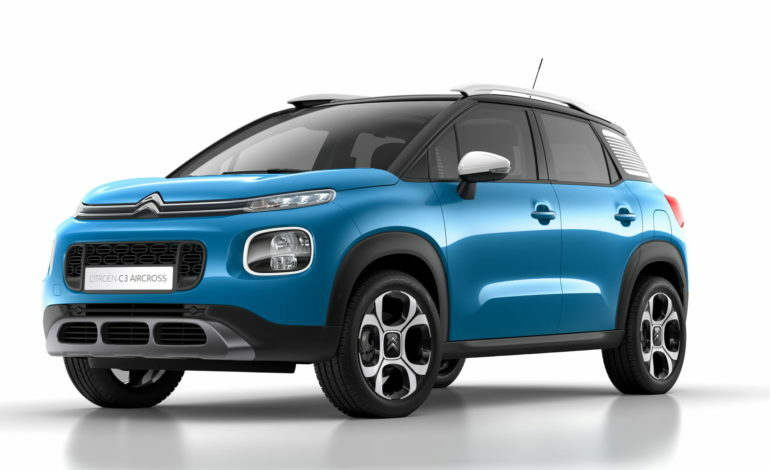 The C3 Aircross SUV has been awarded a 5-star ENCAP safety rating and features Autonomous Emergency Brake (active between 5 and 85km/h), Lane Departure Warning, Blind Spot Monitoring, Speed Limit Recognition and Recommendation, a reversing camera with front and rear parking sensors, Intelligent High-Beam Assist and Driver Attention and Coffee Break Alert. Keyless entry and push button start is a standard feature as is Park Assist for parallel and bay parking. A 7-inch touchscreen is the control centre for vehicle functions such as the automatic air conditioning, radio, phone and media. It also features 3D Satellite Navigation, Android Auto, Apple CarPlay and MirrorLink. The new C3 Aircross SUV features the latest generation of Citroën’s award winning PureTech engine, which delivers new gains in fuel consumption and efficiency. The three-cylinder 1.2-litre PureTech produces 110HP (81kW) of power and 205Nm of torque. With the benefit of stop/start technology, it has a combined fuel consumption from 5.5L/100km and CO2 emissions of just 126g/km. 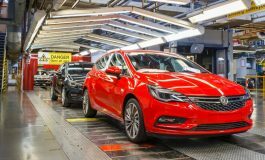 It’s an engine that a panel of 65 judges from 31 countries has awarded the International Engine of the Year for the past four years in the 1.0 to 1.4-litre engine category. The PureTech features Citroën’s EAT6 (Efficient Automatic Transmission 6-Speed) automatic gearbox as standard. 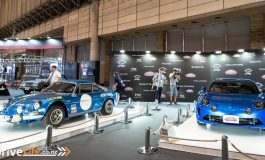 Offering the ultimate driving experience, it features ‘Quick Shift’ technology for quicker, smoother gear changes and optimal driveability. The Citroën C3 Aircross SUV is priced from $33,990 including GST. Please visit the Citroën website for more information http://www.citroen.co.nz/ or configure your own C3 Aircross SUV on https://c3aircrosssuv.citroen.co.nz.